Toni Yates with snow coverage from Morristown, New Jersey. NEW YORK (WABC) -- Snow fell around the New York area Wednesday, making for dangerous conditions on roads and sidewalks and prompting warnings and advisories throughout the region. Plows were out spreading salt overnight ahead of the storm, which left New York City with a coating but dropped upwards of 6 or more inches in inland areas. Dozens of schools were closed as a precaution. In addition to the snowfall, earlier freezing rain and sleet made for a hazardous morning commute, and drivers are urged to use caution on ice-glazed roads. 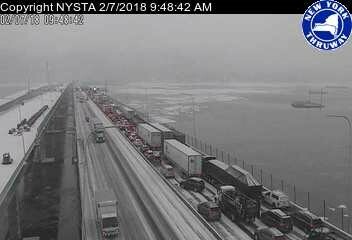 Several accidents involving 25 cars completely shut down the Mario Cuomo Bridge and left several people injured. There were six accidents in the Rockland bound lanes, with multiple cars involved in each accident. At least one woman was ejected and pinned, but the extent of her injuries is unknown. The wintry mix changed over to rain by mid-afternoon as temperatures rose into the 40s, but the dangers still exist for the evening commute. The hardest hit areas were northwestern New Jersey and New York City's northern suburbs. Joe Torres reports on the dangerous driving conditions in Putnam County. Parts of the Adirondack Mountains and the Poconos saw close to a foot. Temperatures are expected to plummet overnight into Thursday, which is expected to be sunny and cold. Check out the latest AccuWeather forecast here. The state's Emergency Operations Center was activated Wednesday morning, and plows were ready to begin clearing roads in New York City if there is 2 inches of accumulation. Have photos or video of the winter weather? Send them to Eyewitness News using the hashtag #abc7NY on Twitter and Instagram.